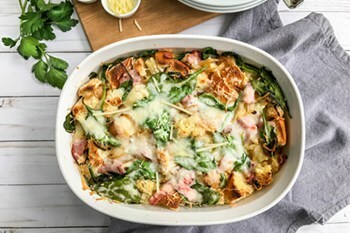 It’s brunch season, and there is nothing, I repeat, nothing more delicious than this Spinach, Ham and Cheese Strata. Oh, My, Goodness. Really, it’s that good! Preheat the oven to 375° and butter or coat with cooking spray a 9-by-13-inch glass or ceramic baking dish. Heat the olive oil in a large sauté pan over medium heat. Add the onion and season with salt and pepper and cook, stirring occasionally, until caramelized, about 15 minutes. While the onions are caramelizing, spread the cubed French bread on a baking sheet and toast in the oven for a couple of minutes until toasted. Arrange one-third of the bread in the bottom of the baking dish, top with half of the baby spinach and Virginia Ham. Then sprinkle one-third of the shredded cheese. Repeat the layering one more time, omitting the cheese. In a medium bowl, whisk together the milk, eggs, and garlic powder. Then season generously with black pepper. Pour the custard evenly over the dish, pressing the bread down with a spatula to absorb the egg and milk mixture. Sprinkle the remaining cheese on top and cover with a sheet of buttered parchment paper or foil coated with cooking spray. Bake the covered strata in the preheated oven for 30 to 35 minutes, or until the strata is cooked through and is brown around the edges. To crisp and brown the top, remove the parchment and turn on the broiler. Broil for about 3 minutes, just until the top is golden brown. Let rest for 10 minutes, then cut the strata into squares and serve.